Bassora (Agenzia Fides) - An appeal to pray for the protesters killed and for "those oppressed and deprived of the most elementary human rights" has been spread in the last hours by Habib al Naufali, Chaldean Archbishop of Basra, who points out that the government of Baghdad must respect the moral criteria in carrying out their task, taking note of the profound injustice "that has fueled the popular uprisings. 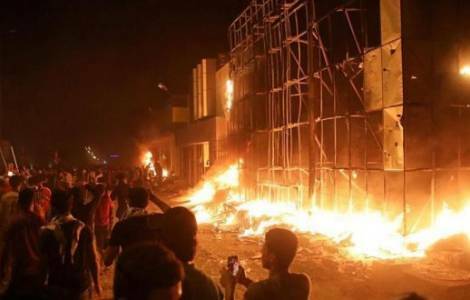 The revolt, exploded in the second Iraqi city for its number of inhabitants (more than two million, of whom more than 90 percent Shiite Muslims) has seen in recent days also the assault of demonstrators regarding government buildings, the state TV Al-Iraqiya, the Iranian consulate and the seats of the government and opposition parties. The Chaldean Archbishop refers to the dramatic moment of the metropolis of the extreme south of Iraq, and focuses on the social causes that triggered the revolt, described by many observers with the features of the civil war. "Yesterday's Masses", among other things, says the Archbishop "half the places traditionally occupied by the faithful were empty, because people could not reach the church because surrounding streets were closed", in a city devastated by attacks on buildings of power and by the repressive interventions of the armed forces ... This - adds the Chaldean Archbishop "did not stop even Muslim brothers and sisters from reaching our church to ask them for the mercy and help of God in front of what is happening". Habib al Naufali defines, what is taking place in the capital of the potentially wealthiest province of Iraq, a "humanitarian, social and cultural disaster": When you hear what is happening in Basra", underlines the Chaldean Archbishop, "you feel ashamed as a human being".